Most classrooms equipped with automated Panopto recorders have touch panel controls that allow you to see the status of your current recording and to start, pause, resume, extend and stop your scheduled recording. Learn more about the benefits and features of in-class recording. Status of the current recording: Name of the current recording and the scheduled start and end times. Status of the next scheduled recording: Information about the next scheduled recording. Start Recording: You may start a scheduled recording up to five minutes early. 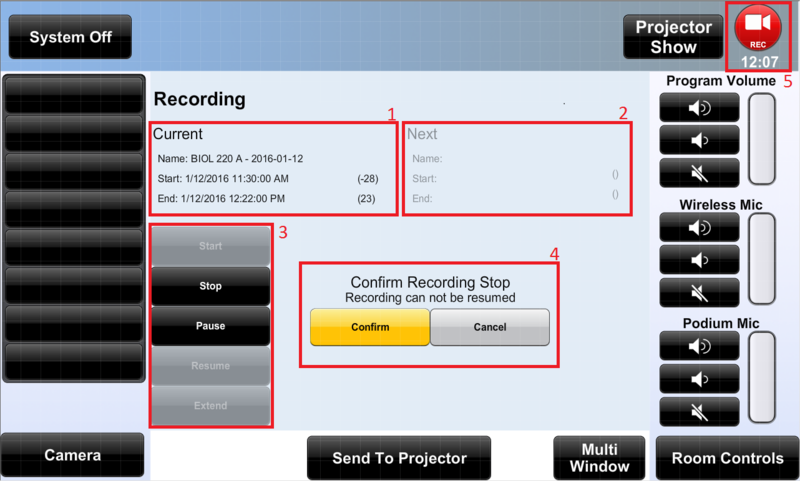 Stop Recording: Recordings that are stopped using the touch panel in the classroom cannot be started again. Pause Recording: If you pause your video, it will continue to record but will not be displayed in the recording. You may use the editor to add the paused content to the recording. Extend Recording: You may extend a recording by up to five minutes. Confirmation message: This message appears if you press the stop button. Once a recording has been stopped, it cannot be restarted. Recording in session confirmation icon: This icon turns red when a recording is in session and displays the time recorded. You can connect your Mac or Windows laptop to an external display or classroom projector by using an HDMI or VGA cable. However, most Mac laptops and some Windows laptops output a copy-protected signal that will prevent your display content from being recorded if you use an HDMI cable to connect. The presentation will appear fine in the classroom, but the recording will not display your slides. To record your content, connect your laptop to the VGA input cable on the podium. 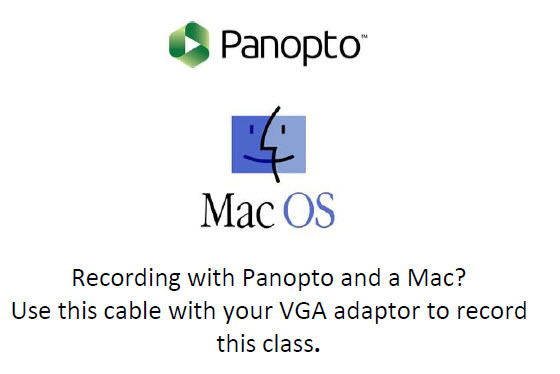 The VGA cable in most classrooms will be labeled. Viewers in the classroom will not be able to see a difference in the quality of the screen display when you use the VGA cable. This connection requires an adapter that is specific to the device you are using. You can find device-specific port-to-VGA adapters online or at the UW Bookstore. You will also need to make sure to plug in the stereo mini cable at the podium to enable audio. Or, use the desktop computer in the classroom podium and skip the worry about cables and adapters. To select a different preset, select the Camera tab/button. The preset camera angle buttons will appear on the touch screen. The camera preview will show the new camera angle you selected. Wear your microphone and turn it on. Even if the volume sounds good in the classroom, it may not be loud enough for a recording if you not near a microphone. And if your voice is not audible in the classroom sound system it will probably not be audible in the recording. Note: The microphone “Mute” button will mute audio to both the recording and the sound system. Understand the UW’s FERPA recording policy, and inform students when they are being recorded. Be aware that even if the projection screen does not appear to students in the classroom, the recorder is still operating unless you turn it off. When recording, do not open anything on the installed computer or your laptop that you don’t want your class to see. Do not have private conversations near your microphone when you are recording. Do not record during exams. If you are using PowerPoint, show your slides in Presenter mode. To schedule an equipment demonstration, email help@uw.edu.